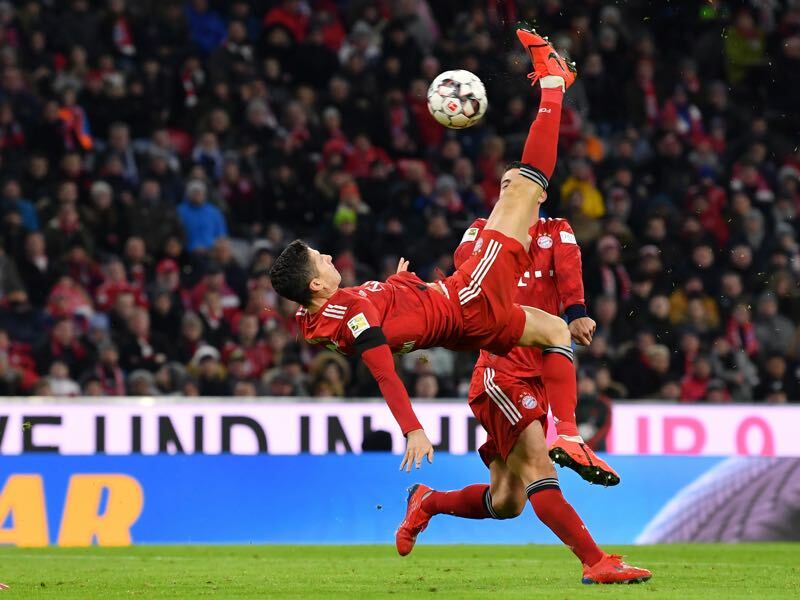 The Saturday night Topspiel Bayern München v Schalke was Bayern’s big chance to close the gap at the top of the table to just five points after Dortmund managed to give away a 3-0 lead earlier today against Hoffenheim. “I want to point out that Robert Lewandowski has a complete campaign for Bayern. I think that Didi Hamann is running a campaign against Lewandowski,” Hasan Salihamidžić, criticised Sky Sport. When the reporter pushed back Salihamidžić remained adamant that Hamann is running an unfair campaign against the Polish forward. Salihamidžić’s comments may have been somewhat unfortunate but at the same time also hit a point. Hamann’s criticism was over the top and not based on facts. Facts that were highlighted in the match against Schalke where Lewandowski was the man of the match and involved in all three goals, highlighting that he is not just valuable as a scorer but also as a creator showing his value for the team even if he does not score. “We were excellent going forward. We managed to play quickly forward and created chances. In the second half, we attempted to control the game a bit too much, which I didn’t like that much. But perhaps that was due to the 120 minutes midweek,” Kovac said. “I have seen a few things watching Liverpool where they might be worried about us. They only managed a 1-1 draw against Leicester a few weeks ago,” Kovac said to Sky Sport after game. “I am confident that we can get our defence in order. Of course, I wish that we would make fewer mistakes. But it is football and without mistakes, there are no goals,” Kovac said. “Sometimes we have to use simple solutions in defence like a tactical foul. “Other teams also make mistakes, not just us,” Kovac perhaps alluding to Liverpool. Bayern might be next in Augsburg but it was Liverpool, in general, overshadowed this game — even more than the Dortmund result. The consensus in Munich is that this defensive setup will struggle against LFC’s fast attack, despite the fact that Liverpool also had problems in recent games. “We were too afraid. If you want to win in Munich you need to be more aggressive in defence. Hence, the opponent had to much time, which is deadly against Bayern. We didn’t have enough possession,” Domenico Tedesco said after the game. One talking point was Sebastian Rudy’s early substitution. “We weren’t aggressive enough in midfield. Hence, I had to make a change and that change was a decision for Omar (Mascarell) and not against Sebastian Rudy,” Domenico Tedesco said. Tedesco also denied that Rudy refused the handshake after the match. “He was sweaty and wanted a quick shower. I was busy coaching,” that is all legitimate. Sky, however, right away speculated that Rudy could be the latest player that Tedesco was losing in the dressing room after he had sold Benedikt Höwedes to Russia and demoted Ralf Fährmann to the bench, but was forced to reverse his decision due to Alexander Nübel’s red card. Overall, Tedesco cannot be blamed for all of Schalke’s problems. Injuries have been a big concern and the unnecessary transfer of Naldo created further problems, new signing Jeffrey Bruma was right away involved in Bayern’s first goal. Hence, it has been a difficult year for Schalke and a tough learning process for Tedesco.